Steamed brussels sprouts and sweet pepper meet a savory-nutty-sweet miso butter. Over top of that, a golden yolked egg steams in the center of crisp toast glistening with ghee . I pour myself a cup of coffee from my Chemex. Ethiopian Sidamo that smells and tastes like blueberry pie. I pull up one of my tall, handmade kitchen stools and eat quietly. Forcing myself to flip my phone over so I can’t check instagram or emails. Looking out of the window at my yard full of brown leaves like toy boats rocking in the wind. I watch a mouse-brown lady cardinal land on my empty, gnarled grape vines. This nosh is so simple as to barely be a recipe. It’s more like hey guys this is what I eat for breakfast some times here’s how I do it. I've been known to sip miso broth for breakfast in the dead of Winter. And eggs are always a go-to. A stark contrast from the icy superfood smoothies of Summer. I love adding miso to my meals for an extra kick of flavor, as in this mac n cheese recipe. But even this simple compound miso-ghee adds tons of flavor to an otherwise rather plain-jane breakfast. You can add compound miso-ghee to just about any steamed vegetables or plain starch (rice, noodles, potatoes, etc.). It makes everything magic. Avocado toast has been serving me well all on its own. But there are days when I want and need to treat myself to something a little bit special. Days when a little extra effort for breakfast is no sweat. Or when I’m massively hungry post-workout. Or when it’s really pretty out and I want to feel like a fluffy cat lazing around in the sun and eating fancy feast. I found this brand of gluten free bread a couple of years ago and it's my go-to. It's gum-free and the texture is amazing. It's only available in the South East USA, unfortunately. But people are doing amazing things with bread these days all over the country. Research what's available from independent bakers in your state. A lot of folks deliver! You can also try your hand at making your own. My friend Thea of Baking Magique has some stellar recipes for leavened gluten free bread which I've been dying to try. This recipe is simple, savory and satisfying. In a small mixing bowl, whisk together the miso and ghee with a fork. Heat a large cast iron skillet over high heat. Add the quartered brussels sprouts, diced pepper and 1/4 cup water. Cover and steam until fork-tender, adding a tablespoon of water more at a time until the veg is soft. While the veg is cooking, toast your bread. Once the veg is cooked, cut off the heat and add the miso-ghee. Stir the miso-ghee into the veg as it melts. Add salt and pepper, to taste, and remove the veg from the pan. Cover and set aside. Using a biscuit cutter or circular cookie cutter, cut out a hole in the center of your bread. Butter the toast, front and back, including the cut-out circle of bread. Crack your egg into a small bowl. Place your frying pan on medium heat. Place the bread and cut out circle on your frying pan. Slip the egg out of the bowl into the center cut-out of the toast. I personally like my eggs sunny side up, so at this point I add a tablespoon of water to my pan and cover to steam the egg. It softens the bread a little bit. But if you time it right it makes a marginal difference by the time the egg is done cooking. If you like your eggs over easy, simply cook the egg for a minute or so (the whites should be mostly cooked) before flipping your toast face down. 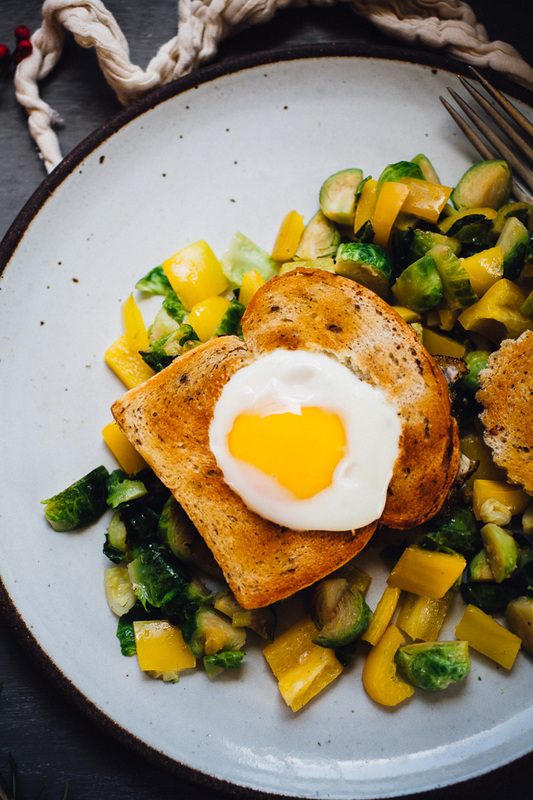 Once the egg in the center is cooked to your liking, remove it from the pan and slide it over top of your miso-ghee brussels sprouts. Salt the egg-in-a-basket as you like. Dig in!